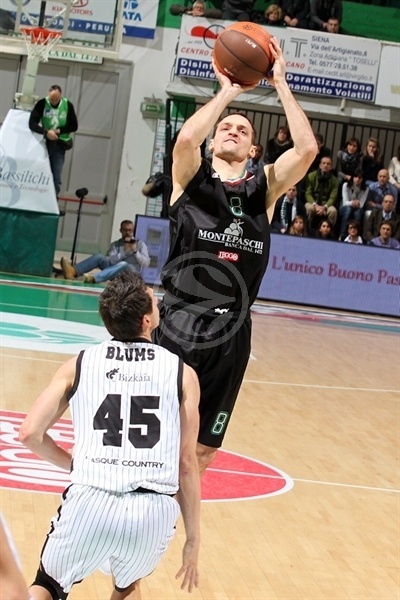 Montepaschi Siena pieced together a 17-0 run that bridged the second and third quarters to crawl out of an early hole and march to an 81-67 home win over Gescrap BB in the teams’ Top 16 Group F game opener. 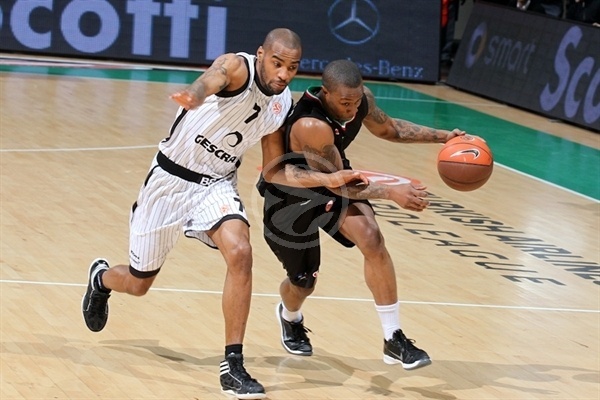 David Andersen and Bo McCalebb scored 18 points apiece to pace the winners. Gescrap started strong and led by 10 midway through the second quarter. Tomas Ress evened the score at 32-32 with a triple in the final minute of the first half and McCalebb and Marco Carraretto took charge in the third as Siena took control. Bilbao never quit and after trailing by 12 late in the third, rallied behind Kostas Vasiliadis to within 6 in the fourth, but Siena finished strong to notch its fifth straight Euroleague win. 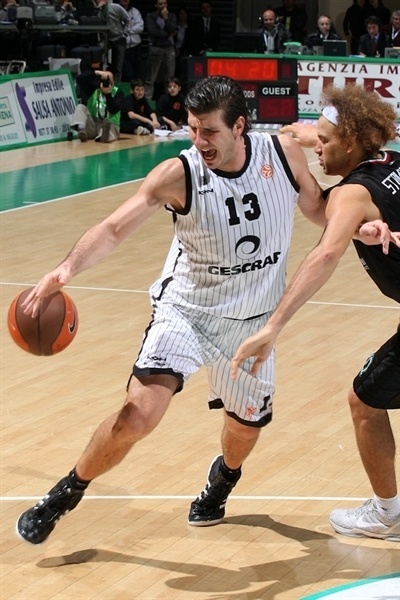 Vasiliadis paced Gescrap with 16 points, Marko Banic scored 11 and Roger Grimau had 10 in defeat. Both teams missed their opening shots before David Moss got the hosts on the scoreboard. But the confident visitors went on top on an Alex Mumbru triple. D’Or Fischer stepped up with a rejection on defense and then Janis Blums connected from downtown. Banic silenced the Palaestra with free throws to make it 2-8. Andersen tried to ignite the hosts with a basket, but then he committed a turnover and after a timeout, Fischer nailed a three from the top of the key to put the visitors up 4-11. Shaun Stonerook looked to ignite the hosts with a three-pointer, but Mumbru matched him almost instantly. The hosts trimmed the deficit with free throws and Andersen made it 12-16. And after Grimau free throws, McCalebb notched his first points on a drive through the lane to leave the scoreboard at 14-18 after 10 minutes. Bootsy Thornton scored his first points to start the second quarter, but Gescrap continued to roll. Axel Hervelle scored on the offensive glass and Grimau dropped in a baseline jumper to extend the lead to 16-24. Igor Rakocevic dished to Andersen outside for a three-pointer, but Vasiliadis came off the bench and sank a triple of his own to maintain an 8-point lead midway through the second quarter. Aaron Jackson zipped a pass to a cutting Grimau to extend the lead to double figures. Nikos Zisis got on board with a baseline jumper and Bootsy sank free throws as the Siena fans started to sing, 24-30. Banic got a shooter’s roll on his jumper, but Andersen fueled the hosts even closer. McCalebb scored in transition before Ress completed the comeback with a triple that made it 32-32 at halftime. Blums went to the bench with an apparent arm injury after the first play in the second half. McCalebb used his speed to blow through the defense in transition for a pull-up jumper and foul. Moss added a bucket in the paint as the hosts started to take over. Carraretto added a smooth jumper, which led to a Bilbao timeout. But Bo penetrated for a floating layup that completed a 17-0 run dating back to the second quarter. Jackson scored his first points and Gecrap’s first of the half, but a pair of Moss baskets put the hosts ahead by double digits, 45-34. 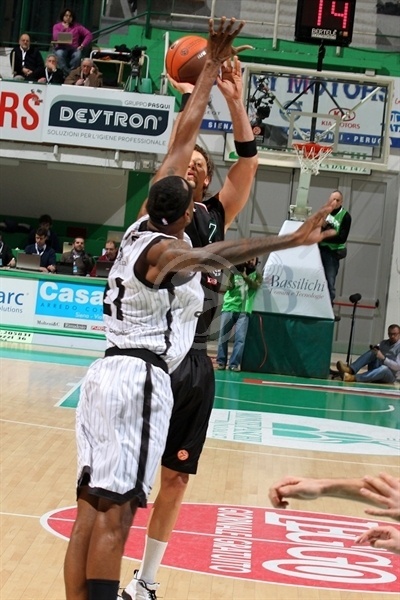 Vasiliadis hit back with a three, but the troubles mounted for the men in black when Mumbru committed his third foul. After a Vasiliadis from closer range, Andersen took charge with a dish to a cutting Igor Rakocevic and a jumper of his own to make it 51-39. A third Vasiliadis triple kept the visitors in the hunt and a Fischer tip in ended a 0-7 run. Vasiliadis nailed another three before Carraretto ended the third quarter with his team up 56-49. The offenses started to flow early in the fourth quarter as the teams traded baskets, but Gescrap needed more than that to close the gap. After two minutes, both teams settled down on defense. Andersen extended the Siena lead to 9 with a pretty move inside and Thornton made it 64-54 with a layup. Moss took a seat with his fifth foul and Hervelle made the resulting free throws. Jackson clawed Gescrap with 2 only to see McCalebb zip to the rim for a basket and foul. McCalebb got back to the line with three-and-a-half minutes left in the game and lifted his team to 71-60. 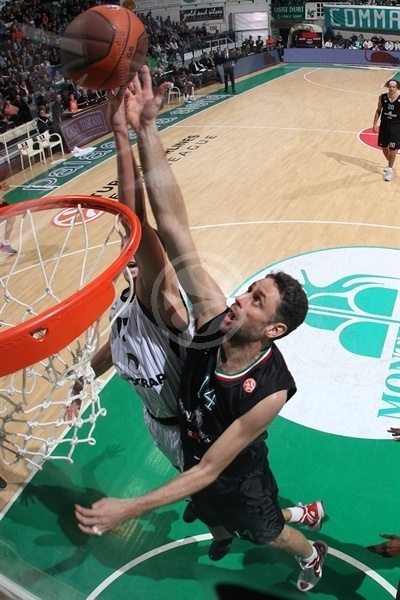 Vasiliadis remained Bilbao’s top scoring option, but his basket was quickly matched by McCalebb. The star guard brought a round of cheers for his next basket in transition that made it a 13-point game. And an Andersen three with just over a minute to go made it 81-66 and essentially sealed the outcome. "I am satisfied, because we played a solid game against a tough team that has size and strength and is among the best rebounding teams in all the Euroleague. I am satisfied because my team came ready to fight, which is the most important thing this time of year." "It was a tough game as is normal in the Top 16, where all teams are fighting for qualification. 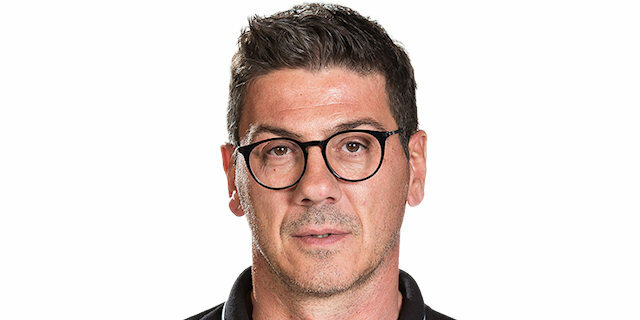 We expected this because Montepaschi is a team that defends very aggressively and has much experience in Europe." "It was a very important game for us and we wanted to play our best and try to win, also because now we have two road games on a row. We knew that it should be a very tough and physical game, but in the second half we played very aggressive, we found some points in the fastbreak and we made good shots."